For over twenty years as physician, I’ve witnessed, time and again, the healing power of tears. Tears are your body’s release valve for stress, sadness, grief, anxiety, and frustration. Also, you can have tears of joy, say when a child is born or tears of relief when a difficulty has passed. In my own life, I am grateful when I can cry. It feels cleansing, a way to purge pent up emotions so they don’t lodge in my body as stress symptoms such as fatigue or pain. To stay healthy and release stress, I encourage my patients to cry. For both men and women, tears are a sign of courage, strength, and authenticity. ​In “Emotional Freedom,” I discuss the numerous health benefits of tears. Like the ocean, tears are salt water. Protectively they lubricate your eyes, remove irritants, reduce stress hormones, and they contain antibodies that fight pathogenic microbes. Our bodies produce three kinds of tears: reflex, continuous, and emotional. Each kind has different healing roles. For instance, reflex tears allow your eyes to clear out noxious particles when they’re irritated by smoke or exhaust. The second kind, continuous tears, are produced regularly to keep our eyes lubricated--these contain a chemical called “lysozyme” which functions as an anti-bacterial and protects our eyes from infection. Tears also travel to the nose through the tear duct to keep the nose moist and bacteria free. Typically, after crying, our breathing, and heart rate decrease, and we enter into a calmer biological and emotional state. Emotional tears have special health benefits. Biochemist and “tear expert” Dr. William Frey at the Ramsey Medical Center in Minneapolis discovered that reflex tears are 98% water, whereas emotional tears also contain stress hormones which get excreted from the body through crying. After studying the composition of tears, Dr. Frey found that emotional tears shed these hormones and other toxins which accumulate during stress. Additional studies also suggest that crying stimulates the production of endorphins, our body’s natural pain killer and “feel-good” hormones.” Interestingly, humans are the only creatures known to shed emotional tears, though it’s possible that that elephants and gorillas do too. Other mammals and also salt-water crocodiles produce reflex tears which are protective and lubricating. 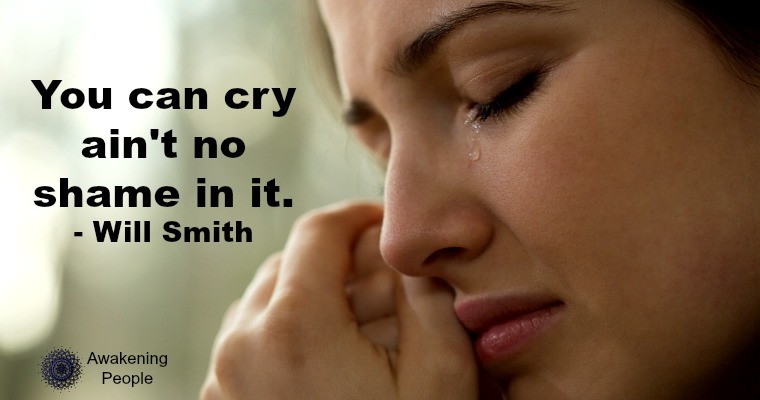 Crying makes us feel better, even when a problem persists. In addition to physical detoxification, emotional tears heal the heart. You don’t want to hold tears back. Patients sometimes say, “Please excuse me for crying. I was trying hard not to. It makes me feel weak.” My heart goes out to them when I hear this. I know where that sentiment comes from: parents who were uncomfortable around tears, a society that tells us we’re weak for crying--in particular that “powerful men don’t cry.” I reject these notions. The new enlightened paradigm of what constitutes a powerful man and woman is someone who has the strength and self awareness to cry. These are the people who impress me, not those who put up some macho front of faux-bravado. I’ve been this enthusiastic about crying for years. In fact, during my psychiatric residency at UCLA when supervisors and I watched videos of me with patients, they’d point out that I’d smile when a patient cried. “That’s inappropriate,” they’d say. I disagreed then; still do. I wasn’t smiling because my patients were depressed or grieving. I was smiling because they were courageously healing depression or other difficult emotions with tears. I was happy for their breakthrough. In my life, too, I love to cry. I cry whenever I can. Wish I could more. Thank God our bodies have this capacity. I hope you too can appreciate the experience. Let your tears flow to purify stress and negativity.